Anyone with kids knows how they tend to take over every room in the house. Wouldn’t it be nice if they had a designated area where all their toys can be stored? Your garage could become that playroom. As with any of these conversions, you will want to find a way to secure the garage door so that it won’t be opened. Nice flooring and kid friendly shelves can make that space into a terrific playroom. Have you ever wanted to invite out-of-town guests over for a visit but don’t have the room? Your garage could easily become your guest bedroom. Depending on the size of that bedroom you might even want to install a small kitchen set up. That way it can become a room to rent out or for a grandparent. A garage is a perfect spot for a man cave. There might already be a workbench for tinkering set up in there but you don’t have to stop with that. Perhaps you can add a pool table or poker table. You can even have a nice bar set up. Another advantage of having a man cave is that it can be decorated anyway the occupant would like. Translation: you take care the rest of the house they’ll take care of the garage! You might be motivated to work out more if all you had to do was walk out to the garage. But instead of just putting up a treadmill or a workout bench why not elevate things? You can install a wall of mirrors and carpeting on the floor. Hooking up a TV can also help improve your home gym especially if you’re doing cardio workouts. Using the garage for your home gym also allows you to bring in more equipment. Before any these garage conversions can get started you’re going to want to set up an appointment with Junk King Cleveland. 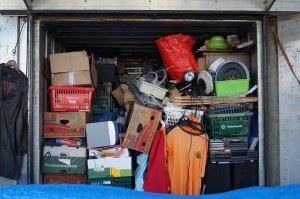 These are the junk removal professionals that can quickly clear out your garage of all its unwanted rubbish. You just have to take the time before they show up to sort through all the stuff you want to get rid of. You’ll be amazed how quickly Junk King Cleveland can clean out a garage from top to bottom. This entry was posted in Cleveland Junk Removal and tagged Clutter, garage, Junk King Cleveland, rubbish on June 26, 2017 by Junk King. Last updated July 31, 2017 .